Around 1/3 of postpartum depression cases actually begin during the pregnancy itself. In recent years, many healthcare professionals and mothers have come forward to say that pregnancy is anything but a serene and joyous occasion. An expecting mothers’ health does not just refer to her physical fitness; it’s about her mental well-being, too. This is why pregnant ladies should tap into proper and well-paced exercise to help boost their mental health. The hormones and chemicals in a woman’s body undergo significant changes during pregnancy. This makes women more susceptible to mental health issues like depression and anxiety. In fact, 23% of women show signs of depression in the midst of their pregnancy, as found by The American Congress of Obstetricians and Gynecologists. Most people then turn their sights toward medication that pregnant women should avoid. However, it is important to find holistic alternatives to address mental health issues as well. A lot of expectant mothers do not always realize the extent to which they can use physical exercise while they are pregnant. Most pregnant women think that they should avoid physical exertion. However, exercise can help pregnant women improve their moods by causing endorphins to move through their bodies. Exercise also helps to boost energy, as pregnancy often makes women feel fatigue and soreness. Additionally, stress is often a contributing factor to expectant mothers feeling uneasy and uncomfortable. Exercise can help release stress from their system. ‘Pregnancy brain’ is also a major cause for concern, which can be helped by exercise. Safe physical exertion can help improve the clarity of an expectant mother’s mind. Exercise can also connect pregnant women with other soon-to-be mommies through prenatal exercises. 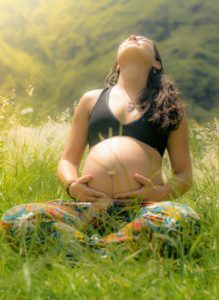 Not only will pregnant women get the physical workout they need, but it’ll also make a great sounding board for sharing thoughts and concerns. Having another pregnant person who can truly relate with what you’re going through can really help ease anxiety and depression. This is another way that exercise can improve an expectant mother’s mental health. Prenatal exercises like swimming, brisk walking, and even low impact cardio are additional gateways that mothers-to-be can use. Not only will it get them out into the world for fresh air, but it also gets them to be in a safe space to exert themselves and sweep away negative thoughts. A woman’s pregnancy is a time of many changes and that does not just refer to the ones that her body will be going through, so exercise is a definite must. Every single facet of a pregnant woman’s life is going to transform because of the life that she holds inside of her. This should galvanize the importance of improving her physical and mental well-being and exercise just might be the tool to help her get it. It would be good for the expecting mother’s support system to help her get the exercise that she needs to keep her in her best health.